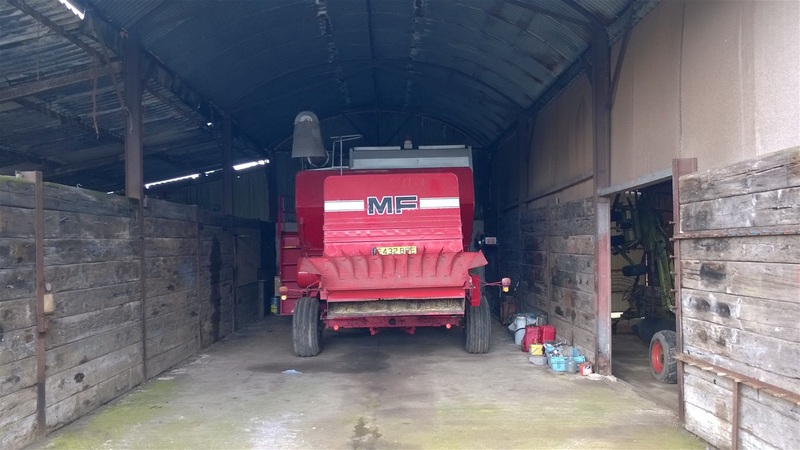 Probably one of the biggest issues with combine ownership is the subject of storage! its a problem even to this day, to be fair the Arable farms over the years have factored in storage with the storage of the grain as such some grain stores act as combine storage as well but normally an arable specific business would normally take better care of there front line machine throughout the quiet months! 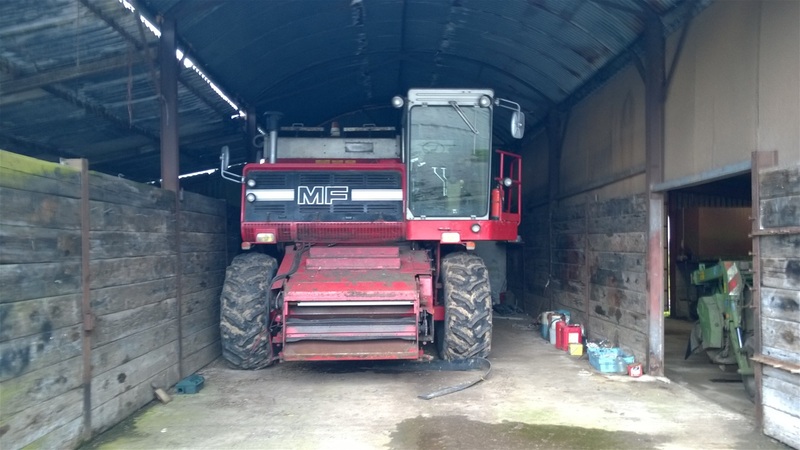 but when you think that this machine is redundant for 10 1/2 months of the year it seems any storage tucked away where the machine can sit and not be moved about to access other implements is a big bonus but a luxury many cant experience. 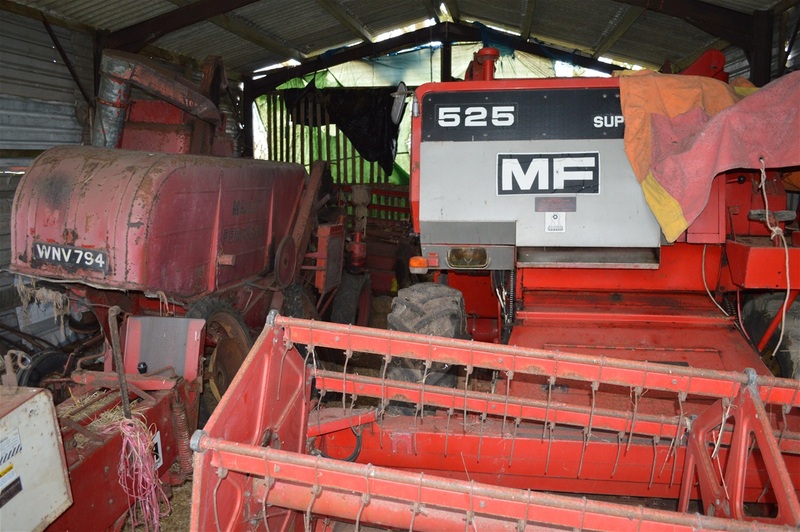 On the other hand mixed farms with stock and fodder, the storage solutions are more critical, the priority for these farms would be foremost to have adequate space storage for there fodder ie straw, hay, even indoor silage clamps,the combine could be left out for the first few months of the winter untill space became available as the fodder was used from the sheds, this wasnt an ideal situation but it happened and when you add the fact that some of these machines didnt receive adequate cleaning and the tin work on the Masseys was full of water traps it didnt bode well for a machine left out for any considerable time. The introduction of bale wrap eased the storage situation for a while as these bales can be stacked outside easing the storage space problems but the ever increasing cost of this option over time has resulted in more farms adding more storage solutions to the expense of not buying this costly wrap figuring that in a few short years the building will be funded from this option!!. One thing in the Massey favour was its low ceiling height unlike the claysons and class and Ransomes of there day, a lot of farms in the fifties and sixties had very low buildings designed more for animals and horse and carts and not for this type of machinery. When you realise that there are numerous belts, chains, and bearings on these combines that need to be protected from the elements you often wonder how any of them survived to this day, we often think here that it's getting to the end of finding any tidy models turning up from a barn somewhere, but occasionally they do normally as the owner retires or sadly if they pass away, usually we find the combines come from farms where there were no sons! 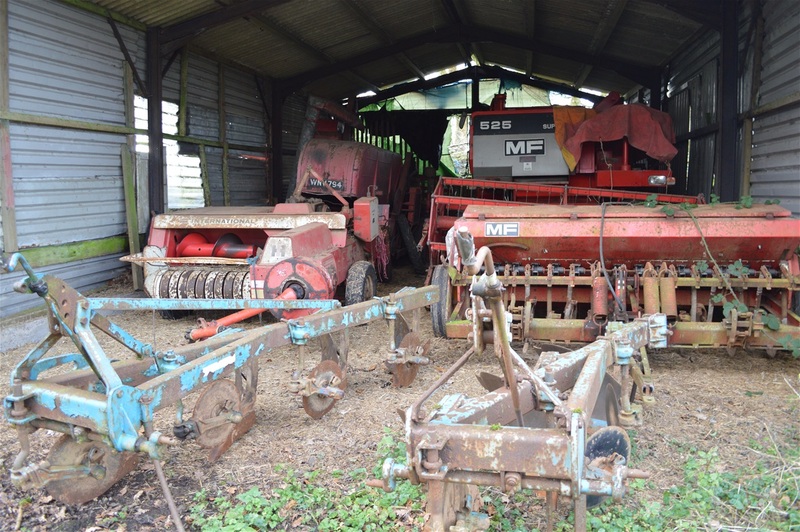 As the sons normally replace older machinery and modernize over the years as any bussines would, but it's very difficult to justify a mortgage to cut just 60 /70 acres a year as some farms would! 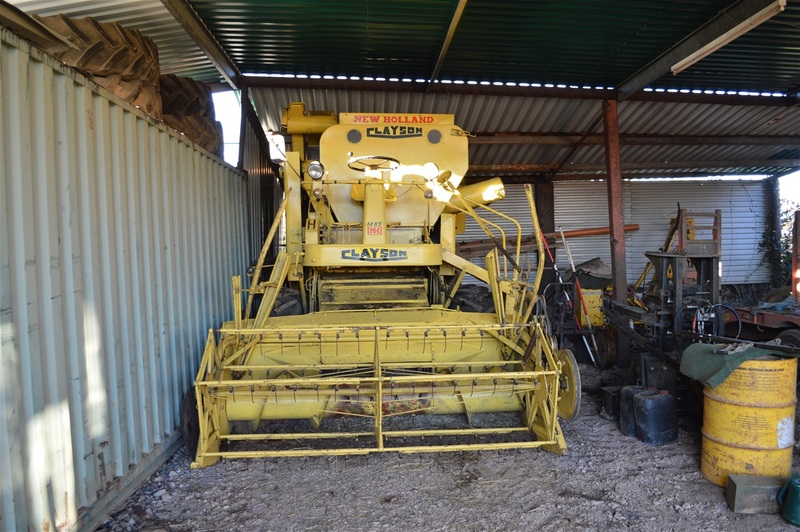 The original owners made do with the machines they had, a decision that has proven a blessing for us individuals who want to collect these machines and use them every year as a lasting tribute to Harvesting history. 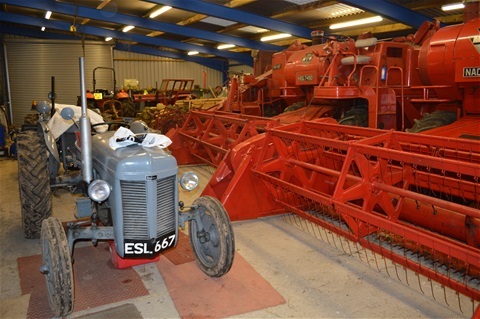 Collecting and restoring these giants of yesteryear comes with a lot of problems storage being no1 on the list! 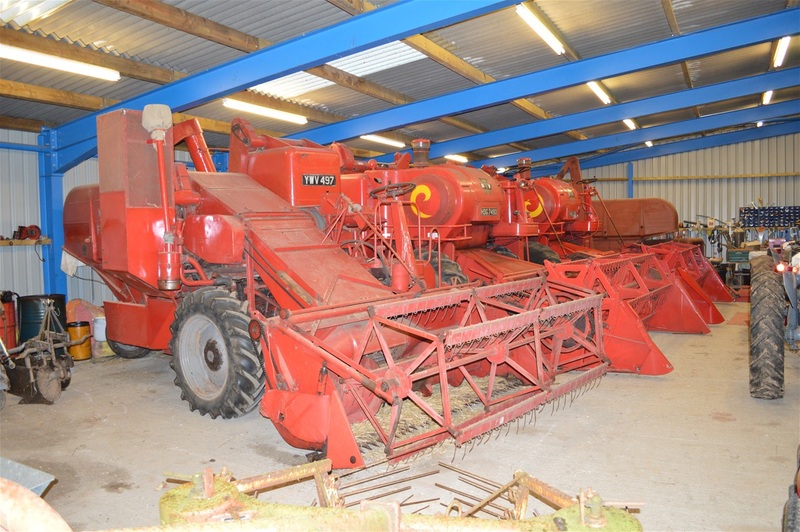 Then the time spent restoring,painting etc Massey s in particular do not keep any parts in stock, unlike class and new holland who still build there own combines and can supply many parts, also getting enough acreage to enable all the machines to work every year is something that we have failed at unfortunately, but we try to rotate each machine every other season to keep them in harvest order, everything we have we endeavour to use it the best we can. Even when you have dry storage the problems dont stop there! the next thing you have to contend with is rodents!! they are a curse for sure and will chew through anything to get to a few grains of corn! we spend a lot of time blowing out each combine with an industrial airline, if you do this you are effectively removing the food from the larder from them, over the years we have tried many things poison, sonic alarms ,hungry cats!! but one thing we have started using over the last few years is Irish deodorant soap!! this very pungent soap is sliced up and scattered inside the combine every where, we put about 10 bars inside each combine and the aroma keeps them away as it sweats during our long damp winter months, the soap is relatively cheap to buy when you consider the cost of belts and electric wiring damage. I have heard of owners who dont clean there modern machines and they pay the price pre harvest when these computer aided marvels flag up warning alarms and software issues which can cost thousands to put right and this is quite common unfortunately, i can appreciate there never seems to be a lot of time at the end of harvest with the following cropping programe starting up but neglecting this job is very costly indeed!! For us here at Stratton on the fosse storage is allocated around four seperate buildings, the 860 is a major headache as it has to be stored in a shed on its own because of its size but thankfully we are blessed that the buildings we use are owned by people who appreciate what we have collected and are happy to help us keep this collection in Somerset!! 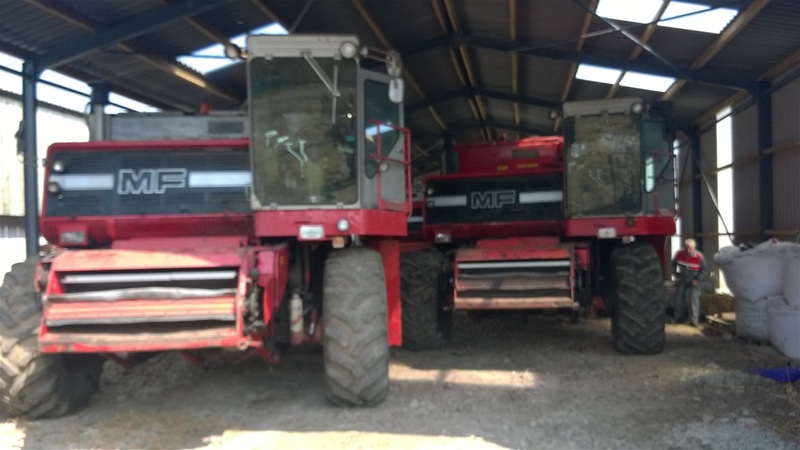 The following is a collection of pictures of our combines in winter storage. 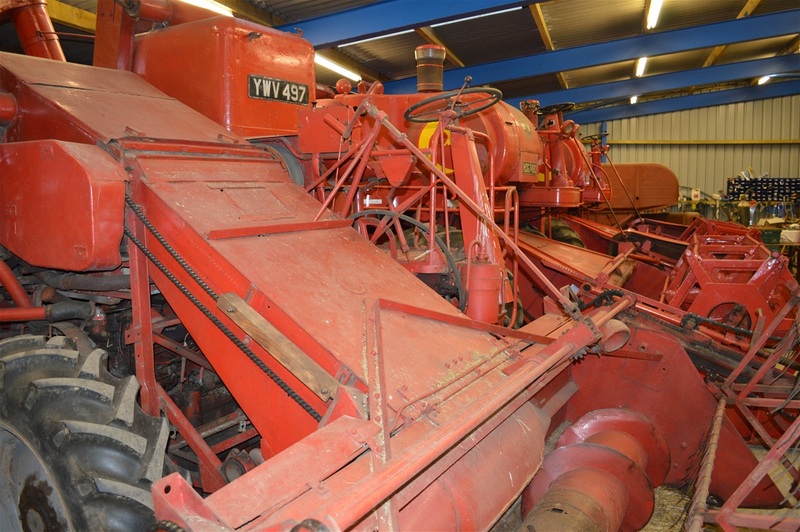 Four combines seen here in workshop . 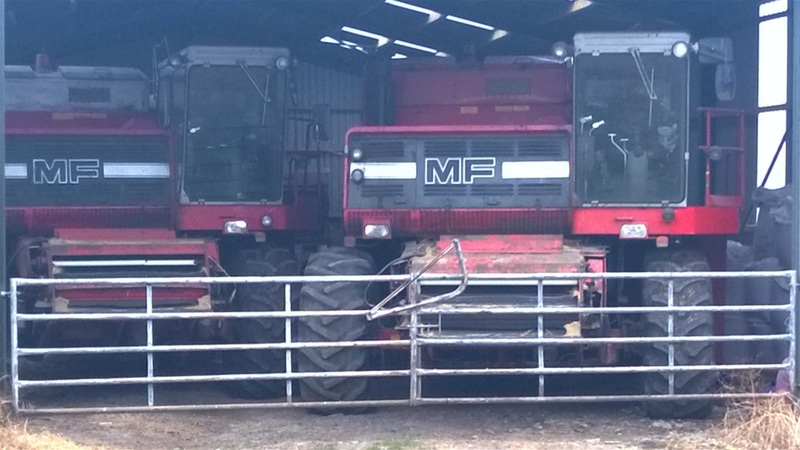 The 525 and 780 special spares machine share a shed! Squeezed up tight to maximize room. Plenty of room for the 860 during the quiet months. 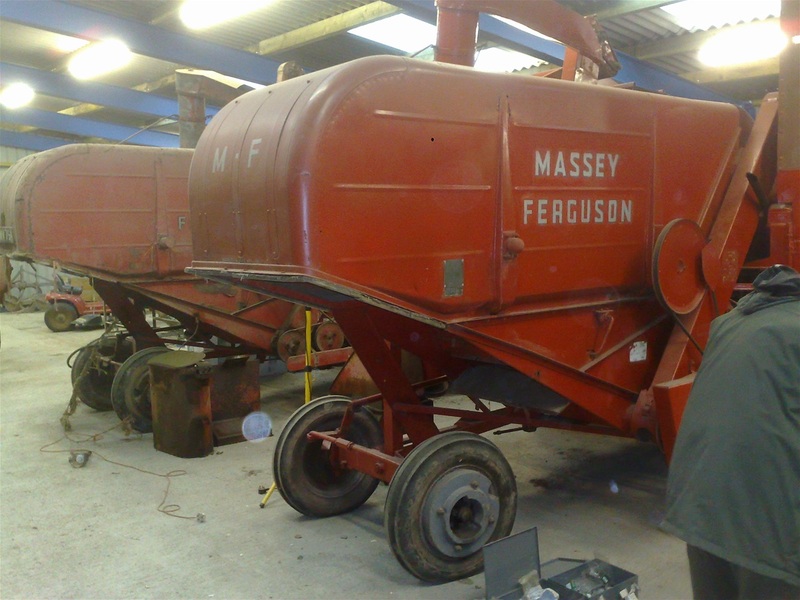 You need a big shed for 4 865s and Chris Hodgson built this one for that purpose! Patiently awaiting whatever the next season brings!! Every bit of storage space is used to the maximum. 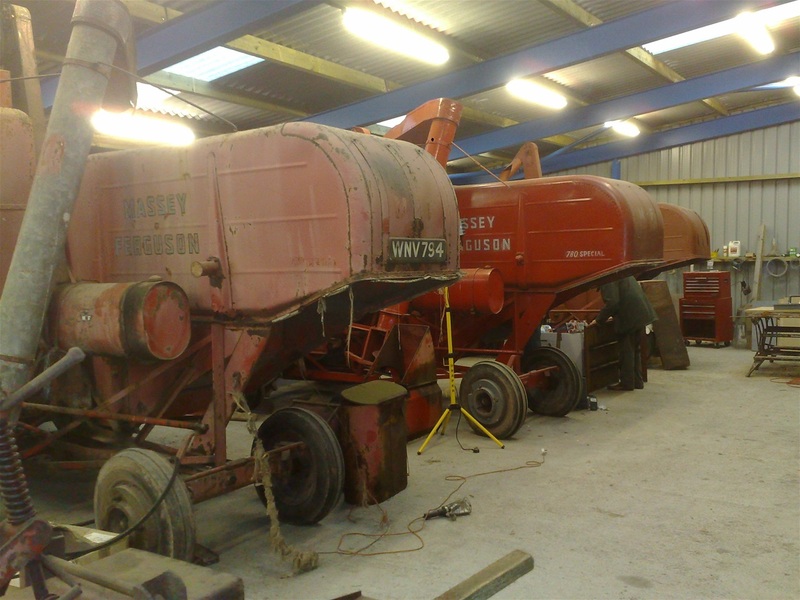 Barry M 89 stored for winter. 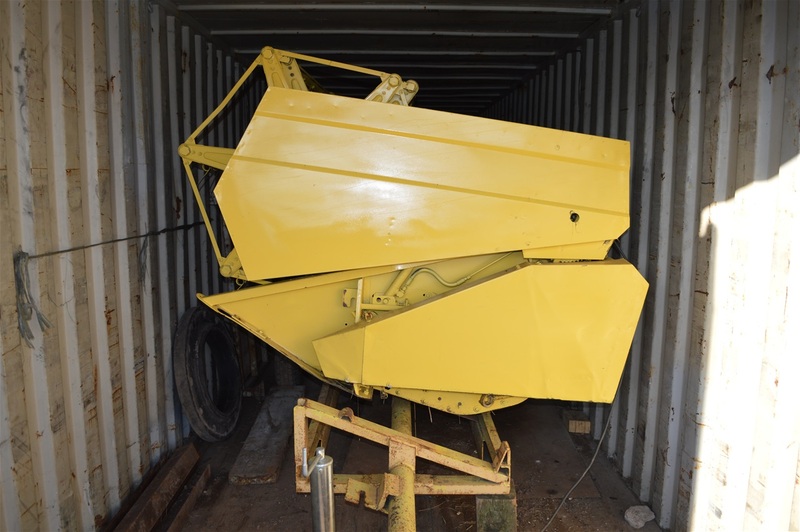 Utilising a container for storing combine tables!! Another view of the 780s.